The Carparelli 3-way Tele 250K Prewired is perfect for Tele-style guitars with Single Coils. These pots are low torque, +- 10% tolerance and are the exact specification as the Fender CTS pots. *note that import guitars may require reaming or drilling out the hole to fit a ¼” shaft. CRL 3-way Switch is in our opinion the markets superior choice above all other switches. Tried, tested and true Quality! Carparelli Prewired Kits use only Quality High Standard components. You will feel the smooth audio taper, easy turning and a super-tight tolerance in each and every one of the pots we select and use for our pre-wired kits. We've measured several of them and they measure to within +0/-5% of specification (many common pots are as much as +/- 20%). You'll really appreciate the full usable sweep these potentiometers provide. The Carparelli Tele 3-way kit features what is known as the "Vintage Wiring" schematic. Basically the vintage wiring scheme results in less high end loss when the volume control is turned down. In addition, the tone control is interactive with the volume control, meaning that how the tone control works varies with where the volume control is set. It's the way to go, and it expands the palette of available sounds from your guitar. 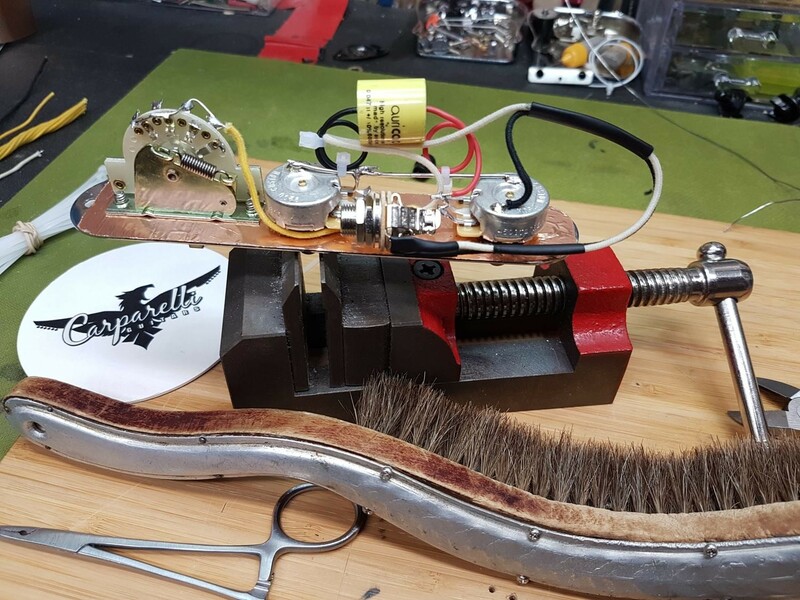 Featuring expert workmanship and the best available components, the Carparelli Tele Prewired Kit will surprise you with how much better your guitar will sound. If you need a different kind of wiring scheme send us an email and we can definitely make one that will suit your needs. *Note if you want to order Multiple Items you can do two things, email info@carparelliguitars.com and let us know what you want to order and we will fix the Shipping Cost to be a pure minium or Shop, Fill out all the Info needed, then Leave the CART and we will get an email with your order and we can again arrange for a very low shipping cost.